New documents show Emergency Response Services to a nuclear disaster at San Onofre have been gutted by Southern California Edison. Watch the NBC video here. 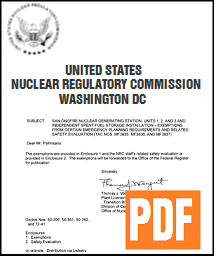 September 29, 2016, SAN DIEGO — Today, Public Watchdogs released sensitive and previously unpublished documents from the Nuclear Regulatory Commission. 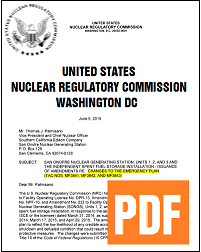 The documents authorize the elimination of required emergency planning and response to a nuclear accident at the now-failed San Onofre Nuclear Generating Station, (SONGS). The exemptions force FEMA, the Federal Emergency Management Agency to discontinue preparedness for a nuclear mishap at San Onofre, and to shift all responsibility for a nuclear disaster to local responders. Put simply, when it comes to emergency response, FEMA no longer has a plan or the ability to mitigate a nuclear disaster at SONGS. The Nuclear Regulatory Commission was required to notify the State of California before allowing the exemptions, and the reply from the California Energy Commission was a scathing rebuke. Click on the documents below, or scroll down for an analysis. Get the NRC’s secret emergency exemption document here, issued June 4, 2015. NRC changes to Emergency Plan: a direct result of exemptions granted the day before. Look for the strike out text. These smoking gun documents outline the elimination of core emergency response and protective measures required by law under the Atomic Energy Act of 1954. According to original research by Public Watchdogs, the amount of nuclear waste at the now-defunct SONGS facility makes it the largest privately owned beachfront nuclear waste dump in the USA. In the event of a disaster involving radioactive waste, 100% of the responsibility for handling the emergency has been shifted to local first responders such as police and fire departments who are ill-equipped to handle a Fukishima-style nuclear disaster. According to these documents, Edison is no longer required to provide an emergency response as required by law. Under Federal law, nuclear power plants are required to maintain full emergency response capability in the event of a radioactive release. However, the law makes no mention of decommissioned nuclear power plants. The NRC has taken it upon itself to interpret this to mean that a decommissioned nuclear power plant is safe. Southern California Edison has claimed publicly (see video) that the containers, which will be buried 108 feet from the public beach, are safe for “eighty years,” but documents uncovered by SanOnofreSafety.org (See last line on Page 7 of document) show that the beachfront casks are only guaranteed by the manufacturer to last 10 to 25 years. most dangerous radioactive dump of its kind in the USA. Why the emergency exemptions are alarming. — No more FEMA response to a radiation disaster. Response from FEMA (the Federal Emergency Management Agency) has been terminated. At Edison’s request, the NRC has ordered FEMA to discontinue any assistance to San Onofre radiation victims. — A Storage Plan that’s designed to fail in 25 years. Although the waste is deadly to humans for millions of years, it is being contained in drums that are only guaranteed to last 25 years (this from the same team that engineered the leaking nuclear generators). — Emergency Planning Zones eliminated. Edison is no longer required to maintain an emergency response capability for the “EPZ” (Emergency Planning Zone) surrounding the new beachfront nuclear waste dump. — Emergency Response Center disabled. Edison’s Emergency Operations Center is no longer able to handle offsite radiation disasters. This is now the responsibility of underfunded and ill-equipped local police and fire departments. — Response from Office of Emergency Services gutted. As a result of Edison’s request, all Federal funding supporting the California Governor’s Office of Emergency Services (OES) response to an emergency at San Onofre has been terminated (that’s right, terminated). — Emergency Public Address Warning System eliminated. The air-raid style evacuation warning sirens, which were in place for years, have been disconnected as a part of the changes to Edison’s emergency response plan (NRC calls this an “adequate protective measure“). — Elimination of 15-minute warning. Edison is no longer obligated to notify local governments and first responders within 15 minutes of a major radiation release. — Coordination with first responders terminated. Edison is under no obligation to work with the local police and fire departments to protect the public when a dry cask explodes or is accidentally dropped. Compliments to Public Watchdog for preparing this important analysis, and providing a close-up view of NRC’s emergency exemption which NRC issued June 4, 2015, in a non-public process. Despite objections by the few informed indepdendent critics, the NRC approval of exemptions never allowed formal ‘public review and comment’ process that normally applies. The premises for granting exemptions should never have been applied at San Onofre (SONGS), due to unique site specific characteristics, and potential threats from seismic events, tsunami, sea level rise, bluff erosion, constant exposure to marine moisture, absence of hardened onsite structure as additional barrier.